Ever since their debut, the models of the Audi A5 family - the Sportback, Coupé and Cabriolet - have impressed with their elegance. The flowing silhouettes, the sharp lines and the muscular surfaces make strong statements. The product improvement adds sharp new accents to the design. 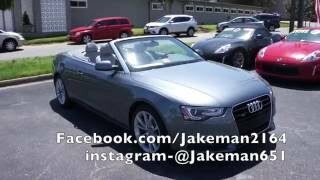 The Audi A5 Cabriolet 2013 is now more distinctive and refreshing than ever. The rear lights and the headlights have been redesigned and are optionally available in xenon plus technology with homogenous LED daytime running lights. New colors and materials accentuate the interior, and many details of the operating concept have been fine-tuned. Audi is refreshing the A5 model series. Advanced technologies are being added to the Sportback, Coupé, Cabriolet and S5 models in the areas of the engine, quattro drive and infotainment for even more efficiency, sportiness and intelligence. The updated design visually underscores the technical expertise involved in these versions. The Audi A5 models are now more distinctive than ever. The rear lights and the headlights have been redesigned and are optionally available in xenon plus technology with homogenous LED daytime running lights. New colors and materials accentuate the interior, and many details of the operating concept have been fine-tuned. Each of the four TDI diesel and three TFSI gasoline units in the new engine lineup include forced induction and direct fuel injection. The new 1.8 TFSI features a number of groundbreaking innovations. Fuel consumption has been reduced by 11 percent on average. The start-stop system and the recuperation system come standard with all engine-transmission configurations. Each engine is matched with the ideal drivetrain - six-speed manual, multitronic, seven-speed S tronic, front-wheel drive or quattro drive. When combined with S tronic, the quattro drivetrain uses the crown-gear center differential and torque vectoring; the sport differential is the perfect complement. The chassis has been more finely tuned, with the optional Audi drive select system and dynamic steering making the Audi A5 even more fun to drive. The electromechanical power steering is new to the Audi A5 family. The new A5 is a highly intelligent car. Its driver assistance systems have undergone intensive further development. The range of infotainment options now includes the Bluetooth online car phone, which delivers a number of special services and connects the Audi A5 to the Internet. Ever since their debut, the models of the Audi A5 family - the Sportback, Coupé and Cabriolet - have impressed with their elegance. The flowing silhouettes, the sharp lines and the muscular surfaces make strong statements. The product improvement adds sharp new accents to the design. The upper corners of the single-frame grille in high-gloss black are beveled. The grille's lateral bars and the Audi rings appear to be sculpted. The new bumper features pronounced air inlets with massive struts, revamped grilles and flat fog lights. Sharply chiseled edges give the engine hood a three-dimensional look; the entire front end appears even flatter and wider. The headlights have also been updated. Their lower edge forms a wave; their interior has been restructured. With the optional xenon plus headlights, the LED daytime running lights form a narrow, homogenous clasp framing the headlight. Audi also offers the adaptive light system with dynamic cornering light and turning light. The rear lights have also been redesigned and are optionally available with continuous LED light strips. The bumper includes a number of additional details. The product improvement has added a millimeter (0.04 in) to each of the exterior dimensions. The Audi A5 Sportback is 4.71 meters (15.45 ft) long; the Coupé and the Cabriolet 4.63 meters (15.19 ft). The range of colors has been reshuffled and now comprises 16 colors. 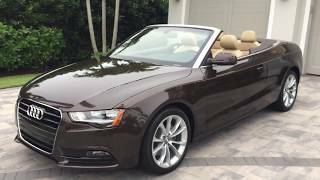 The fully automatic acoustic top of the Audi A5 Cabriolet is available in four colors. The S line exterior package is available for those who appreciate an even more dynamic look. The vehicle bodies impress with high rigidity, outstanding crash safety, high vibrational comfort and low weight. The front fenders are made of aluminum for improved axial load distribution. Aerodynamic fine-tuning measures include a lined underbody. A harmonious balance of proportions and surfaces, fine materials and top-quality fit and finish: The interior of the Audi A5 models reflects the Audi brand culture. It is now more elegant than ever - with new steering wheels, including an option for a flattened ring, new steering column stalks and with narrow chrome clasps framing the control elements. A button is used to directly adjust the optional seat heating and seat ventilation in three stages. Also updated were the ignition key, the selector lever for the automatic transmission, the button for the optional Audi drive select system and the controls of the high-efficiency air conditioning and multifunction steering wheel. All displays are now illuminated in white. New paint covers the bezels on the instrument cluster and the center console, and there is also a new selection of upholstery and inlays. The latter are available in Aluminium Trigon or in walnut or natural fine grain ash. Almost all of the interior colors are new. Fine Nappa leather replaces Valcona in the Sportback, and the armrests can also be covered in leather, if desired. The Audi A5 Sportback is also now optionally available as a five-seater. Another attractive option is the S line sport package. It drapes the interior in black and accentuates it with elegant applications. A sport suspension lowers the vehicle body by 10 millimeters (0.39 in), and 18-inch wheels round out the package. Buyers looking for that special something will find many more customization options in the Audi exclusive range, including the stylish Audi exclusive line with two-tone seat coverings. The Audi A5 family sets new standards for sportiness and efficiency. All engines feature forced induction and direct injection for tremendous pulling power. Even the entry-level engine produces 320 Nm (236.02 lb-ft) of torque. The start-stop system and the recuperation system are standard with all engines - no other manufacturer takes such a rigorous approach. The lineup comprises three gasoline engines and four TDI units. CO2 emissions have been reduced by as much as 22 percent. The completely redesigned 1.8 TFSI showcases the full extent of Audi's expertise. Groundbreaking innovations can be found in the control of the valves and their lift, the thermal management concept, the injection system, the turbocharger and the integration of the exhaust manifold. In the Audi A5 Coupé, the high-end four-cylinder unit consumes on average just 5.7 liters of fuel per 100 km (41.27 US mpg). This best-in-class value corresponds to 134 grams CO2 per km (215.65 g/mile) and is 21 percent lower than before. With 125 kW (170 hp), the 1.8 TFSI accelerates the A5 powerfully. The output of the 2.0 TFSI remains unchanged at 155 kW (211 hp). New to the Audi A5 lineup is the 3.0 TFSI, a supercharged V6 producing 200 kW (272 hp). The diesel engines are also impressively efficient, and the four-cylinder units feature modifications in numerous areas. Equipped with the 130 kW (177 hp) 2.0 TDI and a manual transmission, the Audi A5 Coupé consumes on average just 4.7 liters of fuel per 100 km (50.05 US mpg) - a CO2 equivalent of 122 g per km (196.34 g/mile) and a milestone in the coupe segment. Three V6 diesel units round out the lineup on the top end. The 3.0 TDI with 150 kW (204 hp) is the most fuel-efficient six-cylinder unit in its class worldwide. In the Audi A5 Coupé with multitronic, it consumes on average 4.9 liters (48 US mpg) of fuel and emits just 129 grams CO2 per km (207.61 g/mile). The second variant of the 3.0 TDI produces 180 kW (245 hp). Arriving somewhat later is a particularly low-emissions clean diesel model that will make the Audi A5 the first coupe on the market to meet the Euro 6 diesel standard. Audi offers the ideal drivetrain for each engine. A manual six-speed transmission and the continuously variable multitronic are available for models with front-wheel drive. The quattro models come with a manual transmission or the lightning-fast, seven-speed S tronic. All of the transmissions shine with their convenience and precision, high efficiency and wide gear spread. The long ratios in the upper gears reduce fuel consumption. Members of the Audi A5 family equipped with quattro permanent all-wheel drive and the S tronic transmission also feature the crown-gear center differential with torque vectoring. During normal driving, the mechanical component sends the engine's power primarily to the rear wheels. If necessary, it redistributes the power lightning-fast and smoothly. Up to 70 percent can flow to the front axle, 85 percent to the rear axle. Torque vectoring uses targeted, minor braking interventions to make the handling even more precise. Available as an option in all Audi A5 quattro models, the sport differential provides for maximum precision and high traction. It uses two superposition stages engaged via multi-plate clutches to actively distribute the torque between the rear wheels as needed. The Audi A5 models set standards for sporty dynamics, luxurious ride comfort and excellent driving safety. Most of the components of the five-link front suspension and the trapezoidal-link rear suspension are made of aluminum. The rear suspension bearings and the damper tuning have been updated for more precise handling and even greater comfort. The ESP stabilization program with electronic limited slip differential is standard in all front-wheel drive versions of the Audi A5. ESP uses minimal braking interventions at the inside front wheel for even more agility during dynamic driving. The large brakes - with ventilated front and rear discs in many variants - offer excellent stopping power and are very easy to modulate. 17-inch wheels with 225/50 tires are standard. Options include wheels up to 20 inches and 265/30 tires as well as four new wheel designs. Among the high-end features in the model series is Audi drive select. In the basic configuration, it adjusts the power steering boost, the accelerator characteristic, the shift points of the automatic transmission and the automatic air conditioning. Using a button in the cockpit, the driver can determine whether these components should work in "comfort," "auto," "dynamic" or "efficiency" mode. The latter helps to drive the Audi A5 particularly efficiently. If the car is equipped with a navigation system, there is also an "individual" mode that the driver can largely configure him or herself. Audi drive select can be combined with additional modules, if desired. These are the sport suspension with damper control, the sport differential and dynamic steering, which steplessly varies the steering ratio by nearly 100 percent as a function of speed. Another new standard feature in the Audi A5 model series is the electromechanical power steering. An electric motor generates the right amount of boost for the speed being driven. The electromechanical power steering features a direct ratio, reacts instantly and provides precise road feedback. It intervenes slightly to support the driver when braking on a surface with less grip on one side of the car. The system reduces fuel consumption by up to 0.3 liters per 100 km and up to 7 g CO2/km (11.27 g/mile) because it consumes no energy at all while driving straight. The infotainment systems in the Audi A5 have been significantly upgraded. Audi equips all models in the A5 lineup with a CD radio and eight speakers. The optional top-of-the-line unit is MMI navigation plus with a large hard drive, seven-inch color monitor, 3D graphics and DVD player. Its controls have been improved. The number of hard buttons has been reduced from eight to four and the volume control now features a joystick cap to make it easier to choose songs. Voice control and digital radio reception also received some fine-tuning. An additional option is the Bluetooth online car phone. Audi connect is the catchword for the attractive services this phone brings to the A5, which include Google POI search, navigation with Google Earth images and a WLAN hotspot. The hotspot enables passengers to surf the Internet and send and receive e-mail with their mobile devices. Audi traffic information online is an additional service that does a much better job than the familiar TMC standard of providing the driver with extremely precise and current information about the traffic load along the selected route. All the driver needs to use these functions is a data-capable SIM card. Despite the extensive product improvement, Audi is raising prices only slightly. The price increase for the Audi A5 Coupé 2.0 TFSI is only €200, for example. The base model, the Audi A5 Sportback 1.8 TFSI, costs €33,350. The top models in the series - the S5 as Sportback, Coupé and Cabriolet - have also been refreshed. All S5 models, including the Coupé, are now equipped with the 3.0 TFSI producing 245 kW (333 hp). Compared to the 4.2-liter V8 it replaces in the Coupé, the supercharged V6 consumes on average 20 percent less fuel per 100 kilometers. Average fuel consumption is just 8.1 liters (29.04 US mpg) while performance remains impressive. The S5 Coupé accelerates from 0 to 100 km/h (62.14 mph) in just 4.9 seconds on its way to an electronically governed top speed of 250 km/h (155.34 mph). Visual cues to the updated S models include new lights, modified body details and new crystal-effect paint finishes. Subtle changes can also be found in the interior. The most important technical updates for the Audi S5 are quattro drive with the crown-gear center differential and electromechanical power steering. The special S sport suspension and the standard 18-inch wheels deliver the power to the road.